Davao City – Jing Tan and JP Marfori submitted better cards to emerge as co-overall champions, Saturday at the close of the Rancho Palos Verdes Golf and Country Club 5th monthly medal tournament. Winners of last Saturday’s Rancho Palos Verdes Golf and Country Club Monthly Medal tournament pose with their respective trophies during the awarding rites. Tan finished with 66 for the overall net crown while Marfori edged perennial winner Kuresh Samanodi for the overall gross title with 71. Samanodi wound up as the Class A gross champion with a 72 followed by Kim Il Gyu who had 77 for the runner-up honors. Jericho Bajo had 67 for the net crown while Jong Tan placed runner-up with 70. 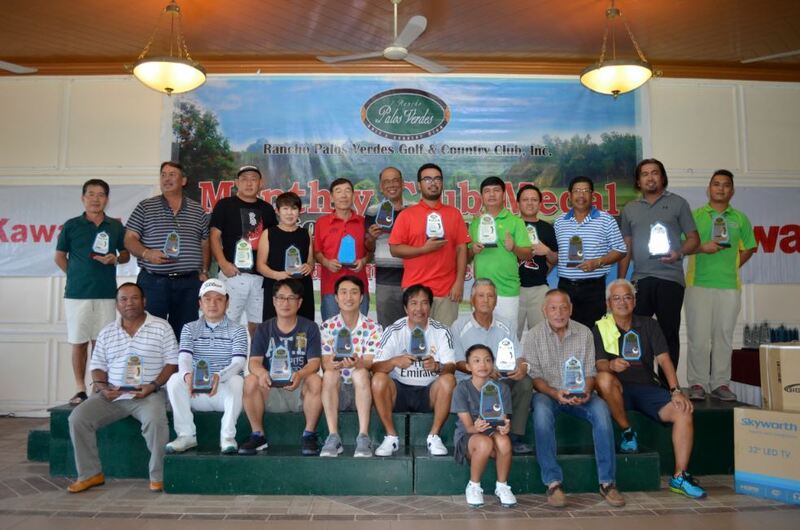 Other winners saw Class B – Jung In Kyu 78 (gross champion), Park Kwang Youl 79 (gross r-up), Emmanuel Sanchez 70 (net champion), Louie Rabat 70 (net r-up); Class C- Yoo Jong Ku 84 (gross champion), Boyet Sonico 90 (gross r-up), Philip Idulsa 69 (net champion), John Naranjo 70 (net r-up); Class D – Arnold Navales 91 (gross champion), Vince Batucan 97 (gross r-up), Michael Lim 69 (net champion), Glenn Olandria 70 (net r-up); Super Seniors – Susumu Ohnari 97 (gross champion), John Siguenza 81 (net champion); Seniors Division – Tamio Sakurai 83 (gross champion), Sam Satoh 84 (gross r-up), Faisal Samanodi 69 (net champion), Bobby Wee 72 (net r-up); Ladies Division – Park Myung Seon 86 (gross champion), Milou Babol 69 (net champion); Guest Division II – Isaclolo Diroy Jr. 83 (gross champion), Ronald Rellosa 86 (gross r-up), Ferdinand Rondina 65 (net champion), John Oberio 67 (net r-up); Guest Division I – Shin Woo Chul 79 (gross champion), Jun Pedro 85 (gross r-up), Al Batao 69 (net champion), Oscar Briones 87 (net r-up); Jungolf – Lexie Perez 125 (champion 11 years-old and below). Special designed trophies were given to the winners by RPVGCC general manager Tommy Inigo during the awarding rites.